Sign up to The Creative Core Readers List today and receive a 30% OFF Special Offer. Life without purpose, no matter how much money you have, is no life at all. You crave the space, time, flexibility and freedom to do the Real Work you want to do when you want to do it. You long to spend time with your family and friends without always thinking and feeling like you should be somewhere else, working. You're finished with always trying to find the time to change life so you can enjoy more creative freedom. You already know searching for more ways to change life on the surface isn't the answer. Books that change you on the inside and the outside are the solution to your core life problem. With Master The Seven Works you’re empowered to do more of what you love and less of what you hate. You'll no longer have the feeling that I don't know what to do with my life. A Disruptively Simple Approach To Better Life and Time Management. Stop Procrastination and Be More Effective. You're always struggling to find the time to change life so you can enjoy more creative freedom. You crying out for better life and time management techniques to help reduce stress and overwhelm so that you can be as productive as humanly possible. More ways to change life on the surface isn't the answer. Despite your better efforts superficial quick fixes only provide temporary relief from the high-pressure symptoms of the High Definition Life context you are living in. These pseudo-solutions cannot address the deeper seated source of your problems. They ignore the underlying cause of the inner conflict that drives this perpetual cycle of work for work’s sake. To solely use time management, motivation and anti-procrastination techniques to help you feel better, less stressed and more purposeful is like trying to keep the rain off with a sieve during a thunderstorm. You will get soaked and your life will still be ruled by Busy Work. When fully connected to your creativity, in whatever form, there is no need for the sticking plaster of better time management. Your Real Work of the moment will be known to you. Identify Busy Work for you and start using simple strategies to eliminate it from your life. Do what you want instead of forcing yourself to do the things you don’t. Feel more purposeful, fulfilled, and happier. Tune in to your creativity and be willing to take action to bring it to life in the world, either at home with family, in your relationships, at work, or in your business. 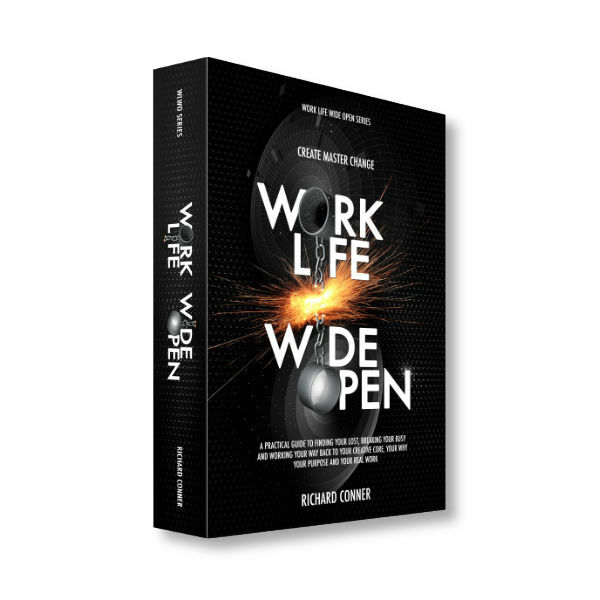 Richard manages to shed light on complex questions and ideas such as purpose in life, self-realization through meaningful work and, mindfulness applied in day to day life. He doesn’t provide one size fits all answers but invites the reader to ask the right questions and tune into their inner wisdom to come up with answers leading to their personal truth. In doing so, he offers extremely helpful tools that the reader can use to bring clarity to their thoughts. Welcome to the High Definition Life, a fractured world of relentless consumption, excessive overwhelm, increasing busyness and a widespread lack of truth and integrity. In this disorientating Idyllic Illusion we constantly agonise over the value we are giving, or not giving and the elusive ‘just reward’ we crave for all the hard work we are putting in. This conflict leads us to question our contribution to our partners, our families and the local and global community we are continually co-creating. We are lost whether to spend more time on our work life to make ends meet and be of value to the world or to focus more on our personal life so that we have something of value to come home to after working so hard. If we are to improve how we engage with these changing facets of life and reduce internal and external conflict in the process it’s clear we must learn how to redefine and reconfigure them. Only in this way will we develop a new life blueprint and supporting set of practical tools to ensure that we can both start and continue working ‘on’ a connected life rather than getting stuck and lost ‘in’ the thick of a disconnected one. The Seven Works is that blueprint and toolset rolled into one simple to understand and implement system that you can start using, in the bigger picture and the day to day, ‘on’ your life as well as ‘in’ it. An Experiential, Anecdotal and Practical Guide to Finding Your Lost, Breaking Your Busy and Working Your Way back to your Creative Core, your Why, Purpose and your Real Work. By using never before seen simple yet extremely powerful transformational concepts and ideas the author delves deeply into the life change process fully explaining how to prepare for, handle and overcome it as it unfolds. This timely and expansive work shows us that with knowledge, clarity and practice we can enjoy a more productive, meaningful, happier, fulfilling, connected and creative life that will benefit the rest of society now when it is most urgently needed. Articles and inspiration on finding your life driven purpose.